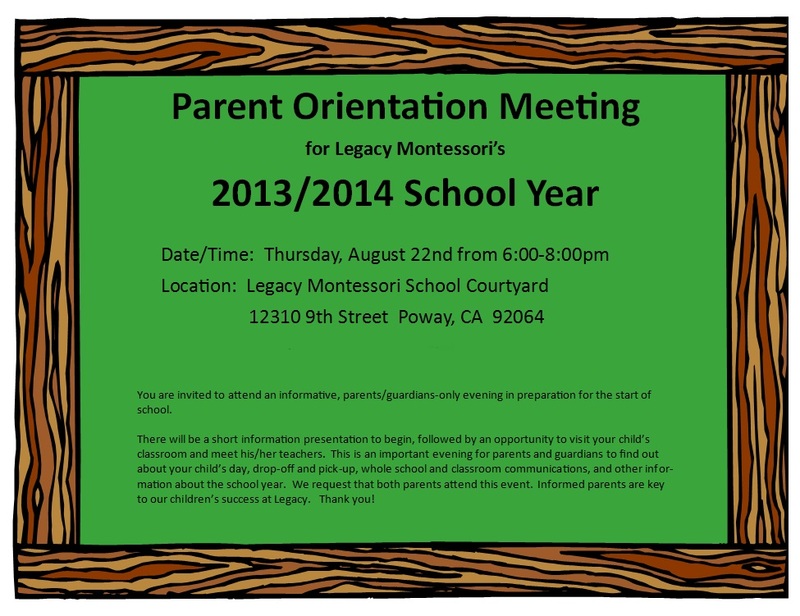 Parent Orientation Meeting 2013/2014 on Thursday August 22, 2013! Our annual Parent Orientation for the 2013/2014 is this Thursday! If you haven’t already, RSVP as soon as possible. This is for all Parents! After our general orientation, you will be visiting your child’s classroom where the Teacher/s will give the overview, routine, and expectations specific to their classroom and students. This is vital so that Parents are Teachers are clear on what you can expect from us, and what we will expect from you. Both parents are strongly urged to attend. First day of school is Tuesday, September 3rd. Also, please bring in any missing registration forms (Physician’s Reports, immunization records, etc.) on or before next Thursday. This entry was posted in Announcements, Parent Orientation Meeting and tagged Legacy Montessori School, Orientation, Poway, San Diego. Bookmark the permalink.